Who’d have thunk it – the trouble with Africa’s big mammals isn’t trophy hunting, climate change or habitat loss; it’s that they just aren’t being killed properly. 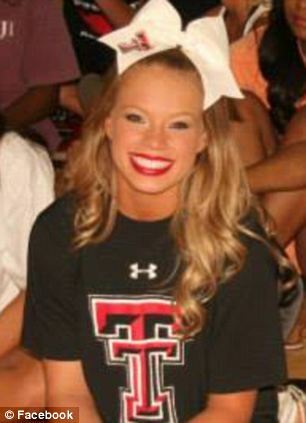 That’s effectively what Kendall Jones, a red-blooded 19-year-old from Texas, would have you believe. The hunter has seen her name in headlines over the last couple of weeks as photos of her posing next to various dead animals went viral and caused an internet maelstrom. Pictures of the pure-blonde Jones holding up the heads of dead African animals while she grins like it’s her birthday are profoundly unsettling, and the racial and imperialistic components of the imagery are striking. Her poses are also often oddly sexual, which makes sense from a marketing perspective: she’s supposedly in discussions to have a TV show by next year, and with America’s lust for young girls and violence, she will probably get it. Her Facebook page contains infographics and data extolling the virtues of hunting, all unsourced or sourced to pro-hunting magazines and lobbies. She claims hunting is simply misunderstood, repeating the common trope among hunters that it is actually they who are leading the world’s conservation efforts. It’s not as though there’s no truth there. Hunting licenses and fees help pay to keep land free from private development. In some cases, hunters target members of a species that have become burdensome or dangerous to the population. Several months ago, just such an endangered black rhino’s life was auctioned off at $350,000. The rationale held that a post-reproductive male is a threat to viable bulls, and if there’s a bloodthirsty millionaire who wants to blow the rhino away, his money can be used for real conservation. Kendall Jones in her native habitat. 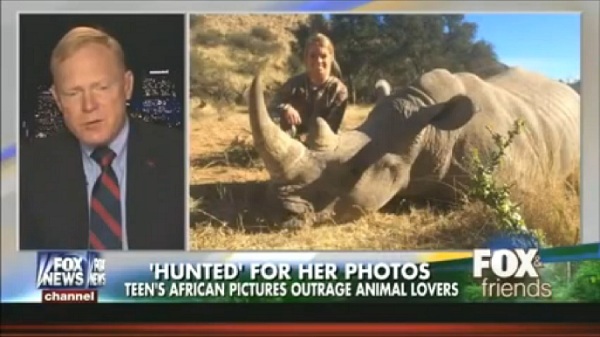 When not cheering for the home team, wouldja believe she’s a leading expert on African wildlife? Me neither. Yet no matter how these hunts are explained, there’s a reflexive revulsion to hearing about them. We’re not talking about hacking away overgrown vines or using dynamite to clear out rocks from a landslide – we’re talking about taking the life of a full-blown, flesh-and-blood, thinking and feeling mammal. Every creature Kendall Jones poses with, beaming her proud Texas smile next to its rolled-back eyes, lived a life she could not begin to comprehend and carried in it a wisdom she will probably never attain. Jones would probably accuse me of allowing emotion to get in the way of science. She’d be wrong. Science narrows the intelligence gap between humans and the rest of the animal kingdom just about every day. Big mammals are more clever, emotionally sophisticated and complex than we ever dreamed, potentially surpassing humans in some cases. Elephants possess a humbling ability to express deep inner feelings. Whales and primates communicate using a form of language we’re just beginning to understand. Even non-mammals are full of surprises, such as the crow that cracks nuts under a car wheel at a red light or the octopus that escapes from her aquarium to feed on animals in another enclosure. Despite using the hashtag #ScienceNotEmotion, Jones allows her passion for hunting to interfere with the way she understands the world. Her life’s calling is objectively psychopathic: the killing of sentient beings. In order to justify it, she touts dubious conservation figures, none of which could ever justify the frighteningly incongruous smile she gleams out in pictures with her victims. Thanking hunters is odd – surely not even she thinks hunting the animal is what made its population explode. The North American Wild Turkey Management Plan, a pro-hunting group, gives credit for the rebound to “improved habitat management and increased conservation efforts focusing on population status assessment and harvest regulation.” For those who don’t understand the jargon, “harvest regulation” essentially means hunting them less. In other words, hunters, upset that they’d nearly extinguished wild turkeys just as they’d done to the dodo 300 years prior, decided to restrain themselves a little bit to ensure there’d be turkeys to hunt long into the future. So, “Thanks to hunters,” sure – but it’s a little perverse. An infographic from Jones’s Facebook. This truly remarkable statement credits the rhino’s rebound to the fact that trophy hunters can’t get enough of them, as though that’s a good thing. 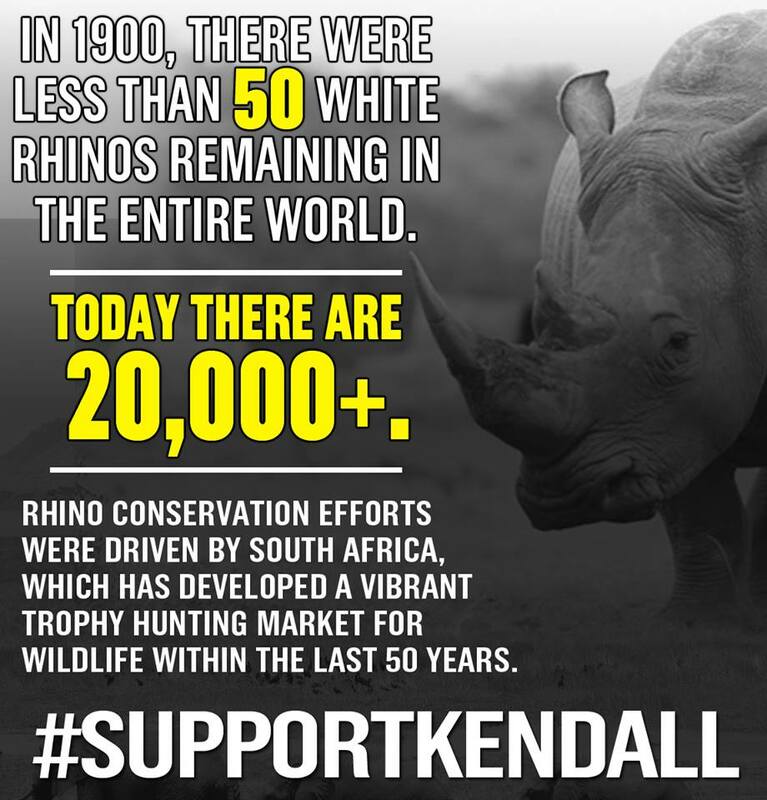 Boosting a population so that there is more of it to kill is Jones’s idea of conservation. It’s the most vicious form of hypocrisy that exists – announcing yourself as a savior of the thing you’re slaughtering. It’s a bit like Paul Ryan branding himself a champion of the poor in his crusade against welfare, or those “civilizing” missions the U.S. undertook in the Philippines. If Jones cared half as much about science as she pretends to, she would recognize these animals as having intrinsic worth apart from the market value of their horn or the tourist dollars of a hunt. In cases where an animal is truly going to cause an endangered species more harm than good, removing it should be a sober, solemn affair, not an opportunity to showcase her million-dollar smile to TV producers. Even tribal hunters who depend on their kills for survival display humility and respect. It’s that despicable tastelessness that’s drawing Jones her flack. Even if hunters are the biggest supporters of true conservation – and that’s obviously highly questionable – her craven glee at murdering so many intelligent, emotional animals is bereft of even the most basic morality and sensitivity. It’s unimpressive on every level – cowardly, sadistic and opportunistic. Knowing and respecting animals as complex, equal beings with a rich evolutionary history all their own would prohibit a sane person from enjoying their death. The hunting lobby to which Jones belongs sees the entire world as a resource pool for humans, but that’s not the kind of conservation we need. What’s needed is the kind of conservation that values every life as worthwhile, the kind that would only kill as a last resort, and the kind that treats human interference as the problem, not the solution. Only then will these animals regain the freedom to be governed by nature and their own wills.